Chavín de Huántar is an archaeological site containing ruins and artifacts originally constructed in the Peruvian Andes by the pre-Incan Chavín people around 900 B.C.E. The Chavín civilization is thought to be the earliest and most developed in Peru's history, pre-dating the Inca by almost 2000 years. The site was first inhabited around 1500 B.C.E., but its most illustrious era was from 800-300 B.C.E., when its influence reached a climax. From then it declined abruptly, though people lived at the site through the 1940s, when its use was restricted for preservation efforts. A large part of the Chavin population was based on an agricultural economy. The city's location at the headwaters of the Marañón River, between the coast and the jungle, made it an ideal location for the dissemination and collection of both ideas and materials. Archeology at the site has revealed a great deal about the Chavín culture which also used the location for religious gathering and ceremony. The transformation of the center into a valley dominating monument had a complex effect. It became a important pan-regional location, such that being at Chavin de Huantar had value in and of itself. The site with its complex of striking terraces and squares surrounded by structures of dressed stone, and highly zoomorphic ornamentation was designated a UNESCO World Heritage Site in 1985. In 2006 a museum displaying relics from the site was opened there. Chavín de Huántar is located 160 miles (250 km) north of Lima, Peru, at an elevation of 3,150 meters (10,300 ft), east of the Cordillera Blanca at the start of the Conchucos Valley. The site is located at the merging of two rivers: the Mosna river and the Huanchecsa. As a result, it provides easy transportation and limited access to outsiders. Chavín de Huántar is in a lowland valley, and higher-altitude valleys are located nearby. Consequently, the people were able to cultivate lowland crops such as maize and high-altitude crops such as potatoes. They were also domesticating llamas in the high-altitude areas for food and to carry heavy loads on the steep slopes of the hills. The site covers 129,167 square feet (12,000 sq m) and holds a large amount of geographical and religious significance, which may be one of the reasons why it was used as a ceremonial center and center of power for the Chavín culture. The site's topography includes several terraces, squares, and two sunken plazas, all having been constructed with stone. Its mountainous location has made it susceptible to destructive landslides (as recent as 1945) and earthquakes (as recent as 1970) over the centuries. The religious significance of Chavín de Huántar depends upon the geography of the site. The merging of two large rivers has shown religious significance in past cultures, and thus it makes sense that the location of Chavín de Huántar was utilized as a religious ceremonial center. The convergence of two rivers is referred to as tinkuy, which can be defined as the harmonious meeting of opposing forces. It has been suggested that Chavin de Huantar served as the meeting place of the natural and cosmic forces. The area is known to have natural hot springs as well as an awe-inspiring view of the Huantsan peak, both of which could add to the religious significance of the site. Chavín culture is known for its beautiful art and design, but the Chavín were also innovative with metallurgy and textile production. Cloth production was revolutionized. New techniques and materials introduced were the use of camelid (llamas, alpacas, vicuñas, and guanacos) hair, textile painting, the dyeing of camelid hair, and the "resist" painting style similar to modern day tie-dye. Advances in metallurgy also occurred during the Chavín's reign in Peru, such as joining pieces of preshaped metal sheets to form both objects of art and objects for practical use. Soldering and temperature control were also advanced during this time. While the designs in Chavín art appear to be abstract patterns, there is almost always representational meaning behind them. Chavín art bears some resemblance to Olmec art, suggesting that there may have been some degree of influence between the two cultures. These parallels are generalized, such as feline subject matter and figure-eight scrolls. Sketch of the Raimondi Stela, discovered at Chavín de Huantar by the Italian-born Peruvian geographer and scientist Antonio Raimondi. It is believed that between 10,000 and 14,000 years ago some of the people that had crossed the land bridge from Asia began populating the Peruvian Andes. Several thousand years of development took place before any civilization was organized. The best-known is the Chavín, which laid the cultural foundations of all later Peruvian civilizations. The Chavín civilization was centered on the site of Chavín de Huántar, the religious center of the Chavín people. The temple is a massive flat-topped pyramid surrounded by lower platforms. It is a U-shaped plaza with a sunken circular court in the center. The inside of the temple walls are decorated with sculptures and carvings. Chavín de Huántar consists of two parts, the Old and New Temples. The Old Temple was built around 900 B.C.E., and the New Temple was added around 400 B.C.E. Chavín de Huántar was used as a site for ceremonies and events. It has also been suggested that it was a home for oracles. The site contains a number of major structures, including Temples A, B, and C, and areas and buildings designated as the Circular Plaza, the Old Temple, and New Temple. Circular Plaza appears to have been a sacred and ritually important open-air space within a ceremonial center. 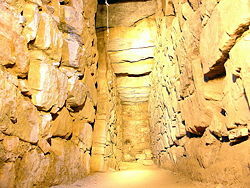 Prior to 800–700 B.C.E., this location had a number of functions, including serving as an atrium for entering Temple A through the temple's north staircase. The plaza in the classic period, after 700 B.C.E., is bounded on three sides by major Temples A, B, and C. The plaza is perfectly circular and is very close to 20 meters (66 ft) in diameter, with a floor consisting of pillow-shaped pavers of yellow diatomite. It appears that a center line of black limestone blocks runs on its architectural east-west axis. Walls of the plaza were constructed of cut stone, principally granite laid in courses of varying width. The two broadest courses were carved in arcs closest to the western staircase and in two pairs of terminal stones flanking the eastern staircase. The Old Temple, constructed early in the site's history, was an inward-facing structure composed primarily of passageways built around a circular courtyard. The structure contained obelisks and stone monuments with relief carvings depicting jaguars, caimans, and various other anthropomorphic forms. The Lanzón Gallery, located at the very center, contained a sculpture of the Lanzón, which is assumed to be a supreme deity of Chavín de Huántar. The figure is anthropomorphic, with a feline head and human body. Mortars, pestles, conch-shell trumpets, and many other items have also been found. Many of these artifacts have an anthropomorphic design or decoration and are thought to be associated with Chavín rituals. The New Temple, constructed between 500 and 200 B.C.E., is also based on a gallery and plaza design and contained many relief sculptures. The Lanzon deity is also present, holding a strombus shell in the right hand while the left hand holds a Spondylus shell. The architectural design of Chavín de Huántar changed over time through an Old Temple development into a New Temple, although it is much more complex than one major renovation stage. Smaller renovations happened consistently, ending about 500 B.C.E. when the New Temple was completed. With the simpler design of the Old Temple, Chavín de Huántar followed the U-shaped ceremonial center design accompanied by a sunken circular plaza. After the New Temple was completed, Chavín de Huántar still embodied a U-shaped ceremonial center design. Although the two phases may sound like the site remained similar, the renovations enlarged the site considerably and a larger sunken rectangular plaza was added. The main objective of the renovations would appear to be based in the idea of allowing more people to gather in one place as the site in general expanded. Excavation of burial sites gave evidence of a small elite class with elaborate burial goods. Tombs contained precious metals, colorful textiles, and other valuables. The majority of burials were more simple, with bodies interred in shallow pits with cotton clothing and a simple tool kit. Local style in art and decoration included scrolls, simple curves, straight lines, and images of wild animals. Chavín sculpture is usually of white granite and black limestone. Carved stone mortars and pestles, conch-shell trumpets, bone tubes and spatulas, and metal spatulas and spoons were found decorated in Chavín style, as were various textiles including tapestries. Pottery was found in a wide variety of forms, including bottles and bowls, decorated with a wide range of distinctive elements. Findings at Chavín de Huántar indicate that social instability and upheaval began to occur between 500 and 300 B.C.E., at the same time that the larger Chavín civilization began to decline. Large ceremonial sites were abandoned, some unfinished, replaced by villages and agricultural land. At Chavín de Huántar, no later than 500 B.C.E., a small village replaced the Circular Plaza. The plaza was occupied by a succession of groups, and building stones and stone carvings were salvaged for use in house walls. Multiple occupation floors indicate the village was continuously occupied through the 1940s. With the arrival of eminent Peruvian archaeologist Julio C. Tello, using the site for residences was stopped. At that time, however, there was no trace of the Circular Plaza; not until the excavations of Luis Lumbreras in the 1960s and early 1970s was the plaza discovered. Lumbreras worked nearly continuously for the better part of a decade in the area between Temples A, B, and C, excavating the thick layer of post-Chavín deposits. His work, however, was interrupted by a sudden termination of funding in 1972. He had found the floor of the Circular Plaza in a number of spots but unavoidably left a substantial quantity of residential remains overlying the majority of the plaza surface. Chavin's state of preservation is poor, but gradually improving. In 1998, Peru's National Institute for Culture (INC) asked for emergency assistance to stabilize and protect the site. During the assistance, which improved drainage and stabilized the galleries, it was noted that the site had never been subject to a specific conservation or preservation effort and the state of conservation of the major structures was extremely poor as a result of climate, structural instability, topography, the materials used in construction, along with badly managed tourism. A new access road was constructed, but before construction began, Stanford University performed excavations of part of the site to secure any archaeological remains and help assure the damage done by the road would be minimal. Subsequently, the Global Heritage Fund (GHF) completed an inventory and cleaned and conserved the entire collection of Chavín artifacts, previously stored in numerous storage areas, homes, and tool sheds. GHF estimated that over six hundred sculptures, ceramics, and archaeological artifacts were endangered. Local people were trained in conservation techniques and employed at the site. The newly built museum incorporates Chavín artifacts at the National Museum and Museum of the University of San Marco in Lima. The goal of those involved in preservation efforts is a world-class scientific consolidation and stabilization of all the primary monuments of Chavín de Huantar, including its rich artifacts and archaeological heritage. ↑ 1.0 1.1 Richard L. Burger, 2008. 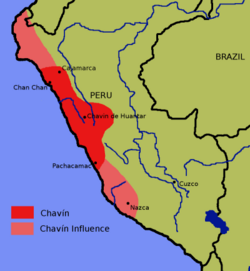 "Chavin de Huantar and its Sphere of Influence." In Helaine Silverman. Handbook of South American Archeology, edited by H. Silverman and W. Isbell. (New York: Springer, 2008. ISBN 0387749063), 681-706. ↑ CyArk. Chavin de Huantar Retrieved February 11, 2009. ↑ Global Heritage Fund. Chavín de Huantar, Peru Retrieved February 12, 2009. Minnesota State University - Mankato. Latin American prehistory Retrieved February 12, 2009. Silverman, Helaine. Handbook of South American Archeology, edited by H. Silverman and W. Isbell. New York: Springer, 2008. ISBN 0387749063. 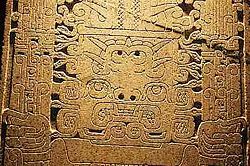 History of "Chavín de Huantar"
This page was last modified on 8 February 2017, at 15:09.